After a fairly eventful 2013, market watchers are expecting subdued activity in the industrial property market this year, with large-scale changes unlikely. On the whole, property measures rolled out last year have tended to be more aligned towards end users. "Generally there were some measures introduced by the government with the intention to support industrialists over speculators," said Desmond Sim, associate director at CBRE Research. Among the notable ones were the Seller Stamp Duty introduced in January, the Total Debt Servicing Ratio framework put in place in late June, as well as a longer holding period for industrial properties on JTC-leased sites and an extension of the minimum occupation period for anchor tenants from Nov 15. The authorities also continued to ramp up supply of industrial land. Chia Siew Chuin, head of research and advisory at Colliers International, said the measures prevented a runaway in industrial property rents and prices. "These have, to some extent, helped to rein in the real estate cost of industrialists," she said. Industrial real estate prices gained 2.8 per cent over the previous quarter in the third quarter of 2013, data from the Urban Redevelopment Authority shows, well lower than the 8.9 per cent quarterly growth over the previous year. Transaction volumes also saw a big drop. In the first three quarters of 2013, going by data as at Dec 26, the number of caveats lodged for industrial property was 1,953, about 37 per cent lower than the same period last year. But consultants also feel that more can still be done. Nicholas Mak, head of research and consultancy at SLP International, said that even as smaller sites and plots with shorter leases are being rolled out to cater to end users, land bids have been increasing. A 30-year leasehold site in Woodlands Industrial Park E9 launched last year drew 10 bidders and a top bid of $72.7 million or some $161 per square foot per plot ratio - a record price for a 30-year industrial plot, he noted. And even as more manufacturers are moving abroad (with a favourite being Johor, Malaysia and its upcoming Iskandar region) as a means of coping with higher costs, this is not a one-size-fits-all solution. "Not all are able to or would like to relocate their business operations to another country due to logistic and labour issues, as well as concerns over political risks and the unfamiliarity with the real estate or labour laws of another country," said Ms Chia. Further, the line between traditional manufacturing and product-related services is becoming blurred in the wake of greater specialisation and with more work getting outsourced. "The government therefore needs to ensure that manufacturing-related companies still have a place in Singapore's factories, and are not disqualified out-of-turn as commercial entities in today's evolving economy," said Ms Chia, who hopes the authorities can give greater detail on what the different requirements for business uses of industrial and commercial properties are. Mr Mak suggested that void areas in strata industrial units not be classified as strata area. The "void area", which makes up saleable floor space but not GFA, refers to the horizontal empty space in a strata unit about three metres above the floor. (see diagram). "That is why some developers like to build strata units with substantial amount of void area. They can sell the void area but it does not cost them in terms of GFA," he said. Mr Mak also thinks industrial developers should face the same requirements as residential ones in providing a detailed breakdown of information in terms of the floor area for strata units. In this year, the sense is that there will be a moderation in rentals and strata sales. "Industrial property prices and rents could soften in 2014 - on the back of new market measures, loan policy tweaks and higher supply amid a cautiously optimistic economic outlook and industrialists' continued cost-conscious stance," said Ms Chia. Some 20.9 million square feet of space is due to come onstream, going by URA data - a historical high. "While demand might be buoyed by a recovering manufacturing sector, there is the possibility that it might not be able to digest the high level of future and existing supply available," said Mr Sim, who expects industrial rents to face downward pressure. He added that property measures have also "sifted out most speculators" and may lead to a more stable strata sales market. The broad picture is unlikely to be too different from this year. 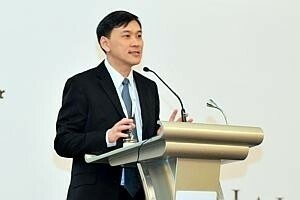 "We don't expect much change in the industrial property market landscape," said Mr Mak.